“Complete Music for Harpsichord.” Joseph-Nicolas-Pancrace ROYER: Première Livre de Pièces de Clavecin (1746); La Chasse de Zaïde (1739?). Yago Mahugo (hpsi). Brilliant Classics 94479 (1 CD) (http://www.brilliantclassics.com/). Royer’s keyboard works are neither demure nor conservative. Couperin’s Book IV (1730) used the harpsichord to hide secrets and suggestions. Perhaps Royer’s opera experience inclined him towards ostentation. He introduces spectacular octave doublings, rippling arpeggios and off-beat chords. Hardly noble, Royer’s Allemande is a heavy-footed ogre. Rockets launch in Vertigo. With its waves of scales and volleys of arpeggios and despite its straightforward Rondeau theme, Le Marche des Scythes is among the most extroverted and virtuosic keyboard pieces of the age. As Mahugo plays it, I could have sworn that the instrument fell out of tune by the concluding chord. But there is also great tenderness in Royer: The Rondeau from Zaïde captivates with its repetitions and settling cadences. The music for La Chasse de Zaïde, an extra which was not published in Royer’s Première Livre, was lent to Mahugo by Rousset. I still plan to keep Rousset’s recordings within reach, although Mahugo makes a smart second. Nothing escapes his attention. Details emerge cleanly such as in the heavily ornamented Rondeau, Le Sensible. There’s a good dose of vibrant resonance with enough space to hear the instrument range between soft and loud. The harpsichord, modeled after a 1638 Ruckers, can take the heat. 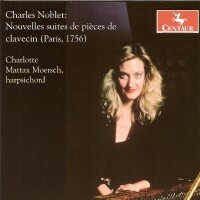 Charles NOBLET: Nouvelles suites de pièces de clavecin (1756). Charlotte Mattax Moersch (hpsi). Centaur Records CRC 3005 (1 CD) (http://www.centaurrecords.com/). This is a wonderful discovery. 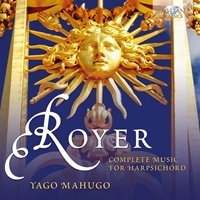 I could imagine this to be Royer’s Second Livre, had Royer mellowed, although in terms of harmonic subtlety, these pieces are closer to Rameau. Contemplating Royer (1705-55) and Noblet (1715-69), we’d have to admit that mid-18th-century harpsichord writing became more extroverted. Most likely, the instruments themselves were more reliable so that repeated notes and multi-note chords spanning both hands became practical. Thirteen pieces straddle two Suites, five in the first, eight in the second. Except for the Suite I’s opening Allemande, Noblet’s titles are descriptive names, La Pétulante, L’Indolente, La Bien-aimée, L’Orgueilleuse, La Sérieuse, et al. A few pieces indicate a dance movement form, though not all. Noblet always provides a memorable singing line. There may also be contrasts, such as the gentle minor transition in the grand Les Catalans which closes Suite II, and hand crossings as in La Promenade de St Cloud (Suite II). Originally published with three sonatas that include a violin part, Mattax Moersch plays just the harpsichord pieces on a bright and bold 1720 Willard Martin after Nicolas Blanchet. 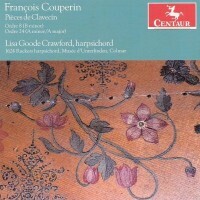 François COUPERIN: Pièces de clavecin: I: 3 (1713); II: 8 (1717). Andrew Appel (hpsi). Orchid Classics ORC 100026 (1 CD) (http://www.orchidclassics.com/). François COUPERIN: Pièces de clavecin: II: 8 (1717); IV: 24 (1730). Lisa Goode Crawford (hpsi). Centaur 3104 (1 CD) ( http://www.centaurrecords.com/). 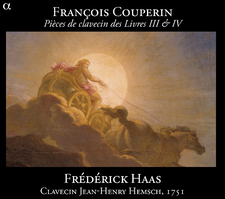 François COUPERIN: Pièces de clavecin: III: 14, 15, 16, 17 (1722); IV: 22, 24, 26, 27 (1730). Frédérick Haas (hpsi). Alpha 173 (2 CDs) (http://www.outhere-music.com/). Appel tackles two large collections: Ordre 8’s 10 selections at 31:47 and Ordre 3’s 15 pièces at 39:39. Appel concludes Ordre 8 with the Passacaille which imbues the group with more consequence than it may merit. The Passacaille’s climbing steps are bold and unexpected, and to conclude the grouping with adventurous harmony suggests a 19th-century practice in which the suite represents a journey rather than a collection in a similar key. I found that Appel was more relaxed in Ordre 3, resulting in deeper feeling. He plays a broad and gracious Frank Rutkowski and Robert Robinette of 1990, a copy of an enlarged 1648 Ruckers. Crawford’s Ordre 8 is 27:42, and her B-side offering is Ordre 24 at 31:01. Employing a 1624 Ruckers with a crunchily gripping sound, Crawford reveals a clever design for Ordre 8. La Raphaéle functions as a somber statement before the Allemande: L’Ausoniéne, the slow La Raphaéle + fast L’Ausoniéne together forming a typical French Ouverture. Crawford puts the Passacaille in the penultimate spot and concludes with La Morinéte for a coda. Ordre 24 doesn’t suggest the same sadness as other Ordres in IV. I like Haas’ earlier collection, recorded in August 2007. Alpha offers two more discs, recorded in September 2007 at the same place in Belgium on the same 1751 Jean-Henry Hemsch. But tastes can change and this time around, Haas’ selection from Books III and IV feels stiff and dry, as in III: 16’s La distraite which seems merely slow and cursory when it could have been more pliant. The pieces with an extra part, La Juillet, Musétes de Choisi, La Létiville, where Haas is joined by Paola Erdas, do seem more lively, perhaps because of the density of lines and slight asynchronicity between the two instruments. Book IV collects several of Couperin’s saddest pieces, yet Haas doesn’t take their full measure: La Convalescente and L’Epineuse (IV: 26) lack expressive fluctuations. However, Haas’ tuning is delightfully strange when L’Epineuse drifts into the remote key of F# major. François COUPERIN: Pièces de clavecin: II: 8 (1717). Johannes BRAHMS: Variations on an Original Theme, Op. 21, No. 1 (1857); Variations on a Hungarian Song, Op. 21, No. 2 (1854). Sergei RACHMANINOV: Six Preludes from Op. 32 (1910). Constantin Lifschitz (pno). Denon CO-78773 (1 CD) (http://www.denonclassics.com/). “Les Ombres Errantes.” François COUPERIN: Var. pièces de clavecin. Iddo Bar-Shaï (pno). Mirare MIR 195 (1 CD) (http://www.mirare.fr/). Perhaps because Lifschitz reckoned that kicking off a London debut with a Bach Suite would be too conventional, he offers Couperin’s Ordre 8, similar in period yet somehow Romantic. From the start (La Raphaéle), there’s a frigidity. Perhaps Lifschitz envisions a stern Baroque visage, or maybe it’s merely opening-night jitters. Mordents and trills quiver, octave displacements appear for color. As Lifschitz progresses through the ten pièces, he opens up: Upon arrival at the Passacaille, he’s grandly dramatic. The final La Morinéte provides a readymade encore. 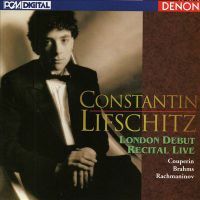 Lifschitz offers lush Brahms. Among variation sets, these are less familiar but rewarding nonetheless. The concluding Rachmaninov Lifschitz delivers with panache and passion. Bar-Shaï performs on piano a collection of pieces taken at random from different Ordres. 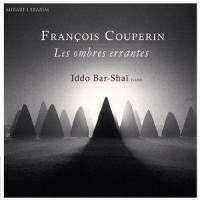 Les Ombres Errantes may just be Couperin’s most depressed work. The 25 pieces, including crowd pleasers such as Le Rossignol-en-Amour and Les Baricades Mistérieuses, move from mood to mood with melancholy prevailing. Bar-Shaï has a refined command of the style. The grandeur of L’Âme-en peine is a bit tongue-in-cheek. Bar-Shaï is more Romantic than Tharaud whose 2007 release (Harmonia Mundi HMC 901956, yes, on piano) remains an all-time favorite in this repertoire. 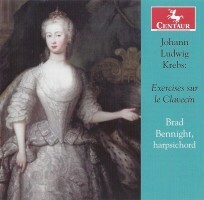 Johann Ludwig KREBS: Clavier Übung IV: Exercises sur le Clavecin, Op. 4 (1746). Brad Bennight (hpsi). Centaur Records CRC 3297/3298 (2 CDs) (http://www.centaurrecords.com/). Despite high praise from his teacher, J.S. Bach, Krebs had difficulty securing a post with a salary to sustain him, his wife and seven children. We may know Krebs today as an organ composer. These two discs (52:31 + 43:26) are the first to collect his bright and tuneful multi-movement suites, consisting predominantly of dances: Allemande, Courante, Sarabande, Menuet, Gigue, etc. A straightforward treble tune will spin out over a bass line. For the most part, while Krebs is generally tidy, attentive listening reveals surprises. Suite No. 1 has a Burlesca, No. 3 has a Harlequinade. We detect no hint that the Classical period is just around the corner. Bennight plays an Allan Winkler from 2007, after a 1711 Donzelague.